When it comes to landscaping, there are plenty of options available for homeowners to use to decorate their yard and loads of gardening ideas available all over the place. One of the most popular features of landscaping today is a raised garden bed. Raised garden beds are perfect to save space in the garden, to make a dedicated spot for vegetables of flowers, and to add unique stylish touch to one’s yard. If you’re someone who is curious about these structures and want to make your own, keep reading. We will look at what is needed to make your own raised bed, and if you prefer an off-the-shelf system, we’ll look at several of the best raised garden beds available. With so many different materials options and designs to choose from, as well as easy DIY options, there are several different paths to take when it comes to raised beds. This article will highlight what exactly these structures are, how a raised garden bed can be made, what materials and designs work best, and how to put them to use. 5 What Type of Soil Is Best for a Raised Bed Garden? If we had to choose just one pre-made raised garden bed, the EcoGardener Composite system would be the top choice. The materials are great, and the ease of use and low maintenance take them over the top. Still, these are expensive, and there are many other ways to make a beautiful, and highly functional, raised bed system. Read on for more raised bed options. ECOgardener Premium Raised Bed Garden Planter Box 4' x 4' – The Most Beautiful Elevated Planter That Will not Crack, Split, warp or Break. Easy Setup and Maintenance Free Design. So, what’s the benefit of using these structures over just planting plants the old fashioned way, directly in the ground? There’s actually quite a few. The first benefit is that a raised bed is helpful for containing plants, like vegetables, without them spreading everywhere. They work to keep these special plants in one specific area so that they can be catered to. Raised beds keep the garden organized. Another interesting benefit is that these structures can help to prevent weeds from spreading. This is due to the bed being raised above the ground, which stops the intricate root system of weeds from growing and scattering. In other words, any weeds in the bed can be quickly pulled out without fear of them dispersing to other areas in the yard. The other great benefit of using a raised garden bed is that more plants can be put in a raised bed than can be put in the ground. Plants can be placed closer together because of the dimensions of the beds, which can not only save space but allow even more beautiful plants and flowers to be planted in the area. There are a large variety of garden beds available, with different designs, and different expansion possibilities. They can basically be broken down into two general categories: on-ground raised beds, and elevated raised beds. The best one to use depends on your needs. If a large number of items need to be planted, an in-ground one might be best. However, if a smaller garden is preferred, like an herb garden, then an above ground bed might be ideal to use. Both of these types can be bought pre-made, although one can make these themselves as well so that it fits the distinctive design preferences one has for their yard. Probably the most common raised garden bed is a box that sits on top of the existing ground, typically made of wood, or (more recently) composite plastic material. These beds sit on the ground and are filled with fresh soil. Plants are placed inside and grow within the confines of the box. They can be pretty easily made with a few saw cuts, but commercial kits are quite inexpensive and can be more flexible than most DIY systems. The pre-made ones are often modular and expandable and can be stacked in tiers and different designs. We’ll discuss a few of these modular designs later. 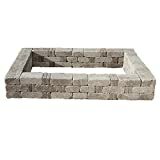 The Greene’s Best Value Cedar Garden Bed [Amazon Link] shown here is an on-ground raised garden bed. Elevated raised beds are lifted off the ground, and are planter boxes placed on legs, usually at about waist height. 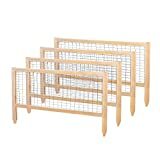 These allow for easy planting without needing to bend over and are ideal for the aging gardener, those with back problems, or those who just don’t want to get dirty with heavy ground gardening. 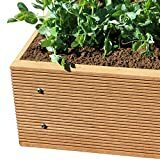 Elevated raised beds are often made of wood, but are also available in plastics and resin materials, like the Keter Easy Grow Planter [Amazon Link]. If you’re specifically looking for information on elevated raised garden beds, see our Elevated Raised Garden Bed article here, as this article is more focused around on-ground beds. Besides wood, as shown in the above planters, raised garden beds can also be made out of concrete blocks, stone, bricks, rocks, steel, and composite materials. In this section, we’ll look at several of these materials, and consider the advantages and drawbacks of each. Wood is probably the cheapest option for raised beds, and wooden garden beds tend to look great. The simplicity and natural feel of a wooden bed make these designs the most commonly seen, and wood has a lot going for it! But wood will gradually rot when placed in contact with the ground. Consequently, eventually over the course of several seasons, you’ll have to replace the planter frame. Many species of wood are great for garden beds: fir, pine, cedar, hemlock, redwood,etc., but all of these, when placed on the ground, will gradually rot over time. The Greene’s Wooden Bed shown below is made of natural cedar. Pressure-treated wood, treated railroad ties, and the like are not to be used as raised bed materials, as the chemicals needed for the manufacture of these woods are toxic, and you don’t want those in your food! Fabric is an interesting material for raised bed gardening, as it’s super easy to work with, and can be used in designs that wood, metal, and the like are unsuited for. These Victory 8 Fabric Raised Garden Beds can be deployed in about twenty seconds and will grow plants wonderfully due to the fabric which allows easy water and air travel through the bed. However, they’re a bit more expensive than some of the other options on a square footage basis. Still, the ease of setup and strength of the non-woven fabric balances out the cost pretty well, making these a compelling option. Instant fabric raised garden bed for plants, flowers and fresh herbs, vegetables and fruit. Ready to go out of the box; No assembly required. Made of a proprietary AeroFlow fabric, a highly durable, UV resistant, non-woven fabric that provides exceptional air flow throughout the soil and root systems and allows excess moisture to easily drain away. 4' x 4' x 11.5" square shape; can be placed on any flat surface (grass, patio, concrete, etc.). 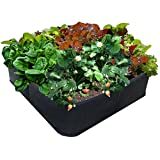 Holds 16 cubic feet of soil or other planting/potting mix (soil, plants and seeds not included). The AeroFlow material will provide you with an incredible harvest yield. Many people choose to use metal for their raised beds, and there are several manufacturers (such as FOYUEE Garden Beds) that sell galvanized metal that is suitable for outdoor use, and will not leach toxic chemicals into the garden. Our general view is that most of the time, the metal garden beds just don’t look great. Metal is a relatively expensive option for a garden bed, and metal has a very cold look that to us doesn’t work well, unless it’s in a super stark environment (where it can look great). For these reasons, we shy away from metal garden beds. OPEN BOTTOM: Sits on the ground garden bed, provide good drainage, keep weeds away from soil, defense against pests, and protect your plants. Rumblestone, or concrete block, garden beds can look beautiful and are incredibly weather-resistant and strong. These are often excellent choices for garden beds, due to their beauty, rugged looks, and maintenance-free hardiness. You can again find these at your local hardware store and assemble yourself, or you can pick up a pre-apportioned kit, like this Rumblestone Garden bed by PaveStone. Of course, like most masonry, Rumblestone garden beds can be pricey! As composite materials become more and more popular for any sort of exterior weatherproof applications, they are showing up in more and more raised bed garden designs. These materials are made of recycled plastic and (often) wood pulp and are super hardy, eco-friendly, color-fast, maintenance-free, and food-safe. The EcoGardener raised bed below is made of composite materials. Though composite raised bed materials are often on the expensive side, their longevity can’t be beaten, and there’s no maintenance to them at all. If we were starting with new raised beds, we would likely move to composite materials from wood, just due to the lack of maintenance. There are plenty of ways one can make an in-ground raised wooden garden bed using simple materials available at the local home store. Below is a basic step-by-step guide to constructing one. The first step to making a raised garden bed is to prepare the space. Look for an area that can be easily built on and will cater best to the needs of the plants that will be put into the bed. Try to loosen up the soil in the area the bed will go over, to help the roots of the plants enter the soil in order to receive nutrients. A soil tiller can be used to achieve this, or a shovel can be taken and put into the ground to help loosen up the dirt. Once the soil has been loosened, collect the remaining tools mentioned above. After gathering the tools, the second step is to start putting the wood pieces together. The planks can be placed in the desired area beforehand so you can see how it will look when officially put together. When satisfied with the results, the planks can then be attached to each other. To do this, take one 4 ft. wood plank and place it directly at the edge of one 8 ft. piece so that they are lined up. Then, take the drill and use it to secure a screw into the edge of the planks so that they stay together. Put enough screws, (about 3-5), on the edge until the planks are secure. Repeat this process with the other edges until the planks are all secured together. An even easier method of setting up a garden bed is to purchase corner brackets for your garden bed. These types of brackets act to tie your raised garden bed boards together and maybe a more cost-effective way to work, especially if you have spare lumber lying around. Different brackets are compatible with different lumber dimensions. The Frame It All Brackets shown here work with 1″ x 6″ lumber. The brackets make your garden easily expandable, which we see as a huge plus. Raised garden beds are addictive, and once you have one, you’ll want more! Assembling four pieces of wood is pretty simple, and most any DIYer can do that. However, many of the commercial raised garden bed kits allow for easy expansion and modular systems, which should not be ignored. The corner posts are usually dovetailed on each of the four sides, and the raised bed side-pieces slide into the corners without needing to be fastened. The pre-cut systems are often not much more expensive than getting the planks and cutting yourself, and they’re all set for future modifications, as you grow your garden. Most of the Raised Garden Beds, such as these Greens 4’x4′ Cedar Raised Garden Beds sold are designed such that each of the corner posts can accept additional wood pieces in any direction, enabling you to expand your (say) 4′ x 4′ bed to a 4′ x 8′ bed, or an 8′ x 8′ bed, or whatever your needs. These expansions can be done without doing any cutting or using any tools. Two Pack Greenes Cedar Raised Garden Kit 4' x 4' x 7"
North American cedar construction creates a beautiful and natural garden setting. The kit is made in the USA from sustainably harvested wood. Manufacturer's Guarantee: If any part is defective, contact Greenes and it will be replaced quickly. Stackable, expandable kits make it easy to customize the garden of your dreams. Stacking 2 of these kits gives the raised bed a 14 inch height! Many of the beds allow for expansion on the ground and additional expansion in tiers, making higher raised bed sections for the plants that need it. To get an idea of what tiered garden beds look like, you can see this Leisure Season Raised Garden Bed. These designs can be especially helpful if you know that some plants have different sunlight requirements based on the location you’ve chosen, or perhaps have different root structures than the smaller plants on the lower tiers. What Type of Soil Is Best for a Raised Bed Garden? Once the wooden planks are put together, the bed can now be placed over the desired area and filled with dirt, or if possible, fresh high-quality compost material from your compost tumbler or worm compost bin. If you don’t have compost available, we’ve found that starting out filling the bed with lobster-compost from Coast of Maine works great to get things rolling. One of the biggest annoyances that any gardener faces are the critters who like to eat your veggies! Chipmunks, rabbits, deer, and the like all love to dig into the vegetable garden and eat your beautiful produce before you’ve had a chance to harvest it. One of the best features of raised garden beds is the ease of adding fencing to the bed. Greene’s makes a great four pack of cedar garden fence that is compatible with their cedar planters. Raised garden beds are the perfect way to add a distinctive touch to one’s outdoor landscaping. Not only can they help to control the growth of plants and weeds, but can be created in many beautiful designs that are sure to catch the eye of many, and are an ideal location for vegetable gardens — especially for those who live in urban environments. Build your own, or purchase one of the many pre-made raised beds in a wide variety of materials and designs. As we mentioned above, our current favorite designs are the composite designs like the EcoGardener line, due to their low maintenance. But the Greenes cedar system is great — modular and flexible. Your garden will be happy, your plants will be happy, and your low grocery bill will make you happy!